Growing up in Victoria, Australia, chickens, or chooks as Aussies call them were always just a part of life. My father kept a mob of white leghorns in a run along the back fence of our home in Geelong since before I was born. Growing up, the chooks were a common aspect of the suburban back yard. Almost every house had them, including roosters. It’s a different story nowadays if you live in the suburbs. No mobs of mad white hens flocking to see what scraps you’ve brought for them to pick at now. Maybe, if you’re lucky you’ll have four or five hens but certainly no roosters under any but the most clandestine and somewhat shady circumstances! When I grew up and left home, I moved to a bigger city in Queensland, and chooks faded out of my life for many years. 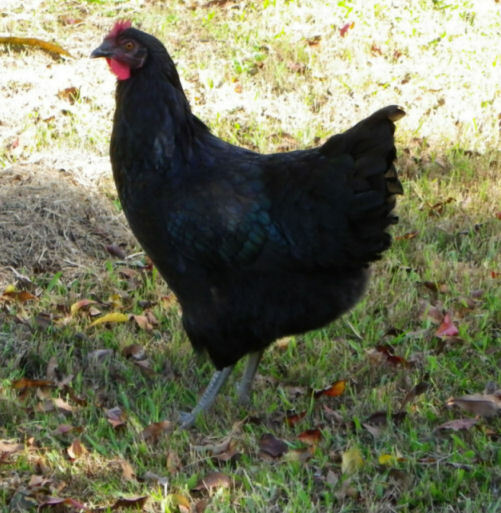 There was the occasional brush with a bantam at my childrens’ schools, or sometimes we’d stroll through the chicken pavillions at the local show (fair) but the idea of keeping hens myself never really occurred to me. It was not until my own kids had grown up and left the nest, and I moved onto a larger property in the country that I began to toy with the idea of a ‘couple of chooks.’ The house I live in now came complete with some preexisting chicken coops and although I talked about putting some chooks into them, I never actually went ahead and did it. Until May 2011 when my eldest daughter decided: “Damn it, I want my mother to have those chooks she’s wanted for ages!” And coerced her siblings and her partner into buying me two hens for mothers day. two young Point of Lay (POL) hens came into my life. I was quickly enchanted (read obsessed) with everything chook related and found myself combing the internet for information, tips, tricks and whatever else I could find about keeping chickens. I joined forums, I read blogs, I followed facebook pages and before too long, I began to itch to have more chickens! On one of the forums I joined, I found a section relating to wanted and sales and after falling in love with photos of Light Sussex hens that I’d seen in my crazed, late night google sessions, I decided to post in that forum asking if anyone lived nearby who had some of these hens for sale. An answer came more quickly than I could have dreamed and in nothing flat, I’d made an appointment to go and ‘look’ at some Light Sussex pullets with a view to possibly buying two of them to add to my flock. The breeder we met that day, had not only Light Sussex, but also Wyandotte and several other breeds of chickens on show and whilst I was still enamoured of the idea of owning a Sussex, my partner’s eye was caught by the pretty markings of the Wyandotte variety. joined our flock. For the time being we have drawn the line at four, but might look into some quail at a later date as well. These little creatures have enriched my life in more than just the eggs (80 of them since early June!) that they provide for our kitchen. Their antics keep me entertained for hours at a time as they scratch and peck around our little orchard. They are funny, smart, useful and each one has her own unique personality. This blog is about the hens who grace my yard with their fluffy, feathered petticoats. I hope that anyone who stumbles upon it will enjoy reading about them as much as I enjoy keeping them! This entry was posted in Australia, backyard hens, Chickens. Bookmark the permalink.